When justice is on your side, it's OK to bend the rules. Don't feel bad about relying on these Just Cause 3 cheats for Xbox One and PC. You can typically find rebel drop beacons in liberated areas and near garages. Their locations on the map are marked by a download icon. Complete all daredevil jumps in Insula Striate to unlock the monster truck in the rebel drop menu. You can also obtain one from the Incendiario Blast challenge; just quit the challenge before you explode. At N 40 48.982 / E 5 36.629 in Maestrale you can gaze upon the wreckage of the Mile High Club blimp from Just Cause 2. Travel to N 40 48.566 / E 5 40.859 in Grande Pastura to find Thor's hammer. You can't pick it up; it's just for show. If you disable the airstrike FOW during act 1, you can find "The Rocket" soap box car at N 40 41.756 / E 5 43.986 in Insula Fonte. At N 40 48.277 / E 5 43.363 in Insula Striate, you can see Cloud's Buster Sword impaled into a rock. Sadly, you can't pick it up. Complete the main campaign or find all 70 Di Ravello tapes. Liberate Cava Grenade in Prospere. Liberate Cima Leon Silos in Lacos. Liberate Puncta Sud in Petra. Liberate Le Gelera in Sud Sirocco. Liberate Alte Potentia in Grande Pastura. Liberate Espia Alta in Capite Est. Collect all vintage parts in Insula Dracon. Liberate Griphon in Costa Sud. Complete all daredevil jumps in Insula Forte. Complete all daredevil jumps in Insula Dracon. Fast Travel Find and activate all rebel shrines. Fire Leech Rocket Launcher Liberate Cava Geminos Nord in Rocca Blauda. Find and activate all ancient tombs. Incendario Monster Truck Off-Road Vehicle Complete all daredevil jumps in Insula Striate. Find all of the vintage parts. Cavouk U-15 Motorcycle Liberate Cava Grande Secunde in Prospere. Stria Facocero Military Car Liberate Porto Le Gratia in Lavanda. Collect all vintage parts in Insula Fonte. Liberate Espia Bassa in Petra. Liberate Cava Geminos Est in Rocca Blauda. Liberate Le Tutor in Nord Siroccos. Liberate Cava Geminos in Sud Rocca Blauda. Liberate Vigilator Nord in Plague. UVK-13 Rocket Launcher Liberate Vigilator in Sud Sirocco. Find the puppy located at N 40 43.371 / E 5 37.057 Insula Dracon. Scale a small pink building located at N 40 42.592 / E 5 35.105 in Insula Dracon and climb onto the adjacent rock face. Find atop a skyscraper in Citate Di Ravellos at N 40 44.316 / E 5 38.710. Destroy all chaos objects in a military base without using any weapons or explosives. Earn at least 3 gears in one challenge of each type. Call out another player in a feat. Bring every vehicle to Mario's Rebel Garages. Launch a land vehicle from every daredevil jump in Medici. Collect every Di Ravello's tape. Unlock rebel drops for at least one land, air and sea vehicle. Complete the "Welcome Home" story mission. F!#& You Missile! Complete the "Missile Cowboy" story mission. Finally on the Offensive Complete "Tangled Up In Blue" story mission. Clear heat level 5 by seeking shelter in a monastery. Earn at least 3 gears in any challenge. Liberate all of Insula Striate. Liberate all of Insula Fonte. Mistakes and Triumphs Complete "The Shatterer of Worlds" story mission. Unlock your first gear MOD and activate it. Unlock all gear MODs in a category. Activate every gear MOD for at least one minute. Adeo, amico! My Little Rocket Man Tether any enemy to a gas canister as it's launched. Locate every collectible in Medici. Locate all vintage weapons and vehicle parts. Light a candle in every rebel shrine. Son of Medici Complete "Son of Medici" story mission. Complete encounters to unlock 10 resupply points. Liberate all of Insula Dracon. Complete "A Long and Dangerous Road" story mission. Complete "The Great Escape" story mission. Destroy every chaos object in a base without exiting your vehicle. Complete encounters touUnlock 3 heat-clearing priests. Top of the World Visit the highest point of Medici at N 40 48.085, E 5 43.220. Unlocked and Fully /Loaded Unlock all weapons and vehicles in the rebel drop menu. Complete "A Terrible Reaction" story mission. Send an enemy flying with a booster explosive. You've Got Gear Earn 5 gears in any challenge. You can further enhance your character's capabilities with hundreds of user created mods. Justcause3mods.com is a trusted source for mods that grant you invincibility and other god-like powers. 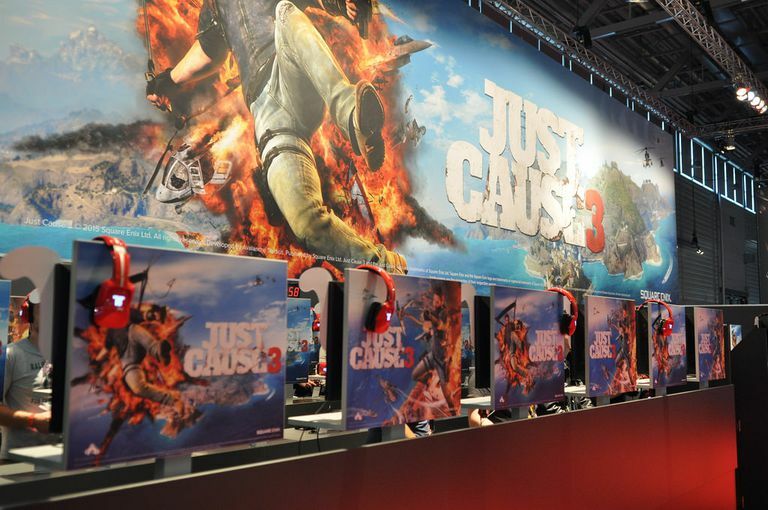 The website also includes information about how to install mods for Just Cause 3. You can only use mods with the PC version of Just Cause 3. Be careful when downloading mods from the web.